Air Niugini has launched its first direct flight between Narita, Japan and Chuuk in the Federated States of Micronesia(FSM) on Saturday 01st September, 2018. Sixty (60) passengers mostly Japanese tourists boarded the first flight out of Narita destined for Chuuk on Saturday night, arriving in Chuuk early Sunday morning. On arrival in Chuuk, a further 60 passengers, comprising a large number of divers joined the flight to Port Moresby from where most passengers continued to other Air Niugini destinations in PNG and Australia. Air Niugini General Manager, Commercial Services Mr Dominic Kaumu who officiated at the departure ceremony at Narita airport said the inclusion of Japan/Chuuk route is strategic move as it provides an opportunity not only for Japanese divers and visitors, but also for those in Europe and North America to travel to the region. Air Niugini’s Acting Chief Executive Officer, Mr Tahawar Durrani said the concept reinforces Air Niugini’s position as a carrier of choice connecting Asia with the Pacific Islands and further enhances Port Moresby as the gateway hub in the region. The Narita/Chuuk flight operates every Saturday while the existing weekly scheduled service POM/Chuuk/Pohnpei remains but now operates on Thursdays and returns via the same route Pohnpei/Chuuk/POM on Fridays. FSM’s Ambassador, John Fritz said this flight will greatly shorten distance and travel time between both countries and encouraged his people to take advantage of the opportunity to visit both FSM and PNG. “ We hope travelers can take this opportunity to explore the untouched beauty of Chuuk and other FSM states, enjoy the company of turtles and dolphins and participate in various activities in one of the world’s largest lagoons. Executive Director of Marketing at Narita International Airport Corporation, Mr Takeshi Arakawa said over 40 million passengers used Narita airport last year and with Chuuk now joining their network, it now increases their destinations to 138 cities, comprising 119 cities overseas and 19 in Japan, more than at anytime in the airport’s history. 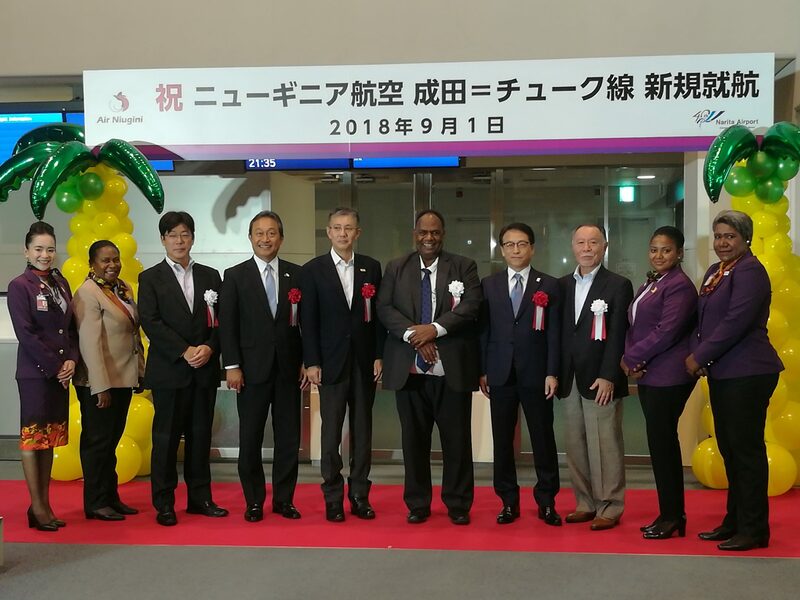 The governments of Japan, FSM and PNG were also acknowledged for granting the traffic rights which allows for the operation of this flight. The air services agreement to formalize this arrangement was signed between the Prime Ministers of Japan, FSM and PNG during the 08th Pacific Alliance Leaders Meeting (PALM) in Japan from the 18th to 19th May, 2018. The agreement gives Air Niugini the right to uplift passengers between Narita and Chuuk on the way to and from Port Moresby.